BOSTON, June 26, 2007 – Technomad Associates, LLC announces that Sheppard Air Force Base in Texas is using a Technomad Military PA System for two courses operated by the Medical Readiness Training Center on the base. The system is primarily used for two advanced courses: EMEDS, Expeditionary Medical Support training, a course that simulates a deployed hospital setting; and CASF, Contingency Aeromedical Staging Facility training. The latter is a component of the Aeromedical Evacuation Training course that simulates a deployed holding cell for casualties being transported via an Aeromedical Evacuation system. The Medical Readiness Training Center installed a Technomad MilPA4 Turnkey package, featuring four Technomad weatherproof loudspeakers, a Technomad SuperConductor MP3 audio player for storage and playback of sound effects, a pre-wired amplifier to drive the audio signals, and a signal processing rack with a wireless microphone, CD player, speaker stands and cables. The loudspeakers were integrated as a fixed installation in a large outdoor Tent Pad that serves as the training site for both advanced courses. The speakers are evenly divided between opposite ends of the Tent Pad, with two speakers apiece designated for the EMEDS and CASF training courses. The courses are conducted independently of each other at different times. The speakers are installed on tent poles at an elevation of eight feet for the best possible audio dispersal. All four speakers run cable to and up the 15-foot observation tower in the middle of the course. A supervisor at the top of the tower runs the exercises, using the Technomad SuperConductor audio player to playback sound effects over the loudspeakers to impart realism into the simulations, and uses the supplied wireless microphone for occasional voice announcements. 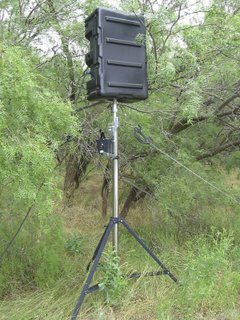 The Medical Readiness Training Center uses the Technomad speakers with their ability to survive the harsh northern Texas environment. The speakers are sealed in hard plastic cases that came with the system when not in use, but are also weatherproof with the lids off and have been able to withstand the harsh temperatures and variations through the winter, including heavy rains, without any problems. The Technomad system is typically used on Thursdays for 12 hours a day, from approximately 3 a.m. to 3 p.m. to simulate daytime and nighttime scenarios that a medical training staff could potentially face in a deployed hospital or air evacuation environment. The system can play sounds instantly or automatically on a schedule set by an operator. This allows the operator to play a schedule of sounds throughout the training exercise, and interject occasional non-scheduled effects on the fly. The primary audio coming out of these speakers represents a variety of sound effects designed to impart more realism to exercises. The time of the day and the light conditions dictate what kind of sound effects are played at any given time, combined with the intended threat environment to be simulated. The system was pre-loaded with sounds such as bombs, bugle calls, guns and aircraft, and offers the ability to load up to 1 GB of their sound effects, voice announcements, or alerts directly to the SuperConductor’s USB drive or via Ethernet. All sound effects come through intelligibly with no report of any garbled word-based speech over these speakers. This system allows the Medical Readiness Training Center to fit an entire gamut of experiences and interactive requirements to all participants over the course of their 12-hour exercises. Operators continuously devise new ways to inject more realism into these exercises. 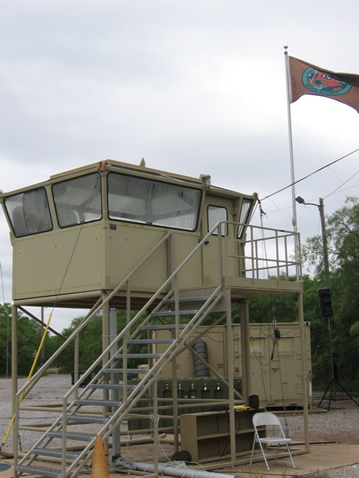 Technomad Military PA systems are used at military bases around the globe for a variety of training applications and military ceremonies, as well as mass notification and forward operating base PA systems. 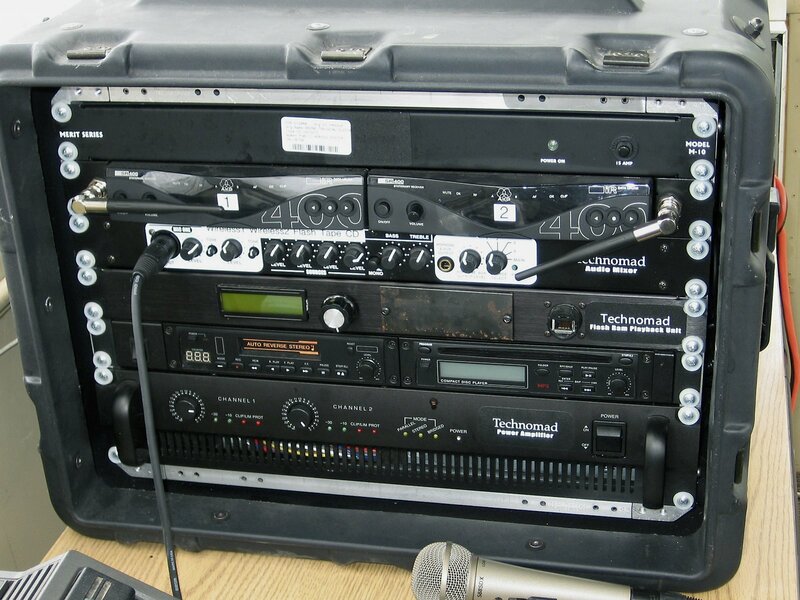 All Technomad Military PA systems offer CD-quality digital audio and speech intelligibility far superior to traditional horn speaker systems that suffer from inherent distortion and narrow audio bandwidth. Technomad Military PA systems arrive to all military customers pre-wired and ready to use, with a typical setup time of 15 minutes or less. Setup can be accomplished by a single operator regardless of audio expertise. All systems are built into rugged flight-cases and are fully weatherproof. Protective gasketed lids clamp onto the front of the loudspeakers and the control rack, converting the system into flight-cases ready for convenient transport. 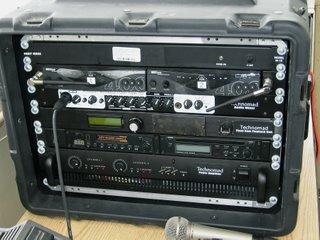 System options include wireless microphones, telephone system interfaces, LMR ( land mobile radio ) interfaces, solar and wind power, DC power or ‘euro’ AC power adapters, and the new SuperConductor military MP3 player. Technomad Associates, LLC, founded in 1995, designs and manufactures loudspeaker systems for the professional audio and security / military technology / mass notification industries. The company invented the first reliable full-range military PA systems and now offers eight networkable models with range up to one mile, as well as the SuperConductor military MP3 player and Firefly ultra-lightweight PA system. Technomad systems are widely used for FEMA CPG 1-17 / UFC 4-021-01 alerting applications.